CIAK Starter is leading the technological revolution among car batteries in Croatia! The most renowned Croatian car battery CIAK Starter, which has been installed in numerous cars, commercial vehicles, buses, tractors, ships and motorcycles for the past 20 years, is still being developed and is keeping track with the newest technologies on the market. A few years ago, the demand to decrease the greenhouse gas emissions had put a huge obstacle in front of classic car batteries – the demands from the EU and, later, the car manufacturers were something the standard car batteries could not cope with. Because of this, a completely new type of battery, better known by the acronym AGM (Absorbed Glass Mat), had been developed in cooperation with the world’s top car manufacturers. The key advantage of these batteries lies in the fact that they were capable of withstanding thousands and thousands of repetitions of being turned on and off more than the previous car battery technologies allowed, and so the production of cars with the Start-Stop function could begin. The Start-Stop technology is becoming more and more present on the market – in the past few years, over 65% of new cars in Europe had the Start-Stop technology and had a factory-installed AGM battery. CIAK Starter AGM is the first Croatian Start-Stop car battery. CIAK Starter AGM, the most advanced Croatian car battery and the first Croatian Start-Stop car battery has been developed in cooperation with the experts who designed this technology. In the world of car batteries, it is only the longevity of the battery that brings about reliability and recognisability, and over 20 years of tradition has pushed CIAK Starter Car batteries into the central focus, while the new CIAK Starter model has pushed things even further. As is the case in existing lines of CIAK batteries, the biggest attention has been dedicated to production cost optimization, which would allow us to provide the almost identical battery quality, but at prices much more approachable to our market. 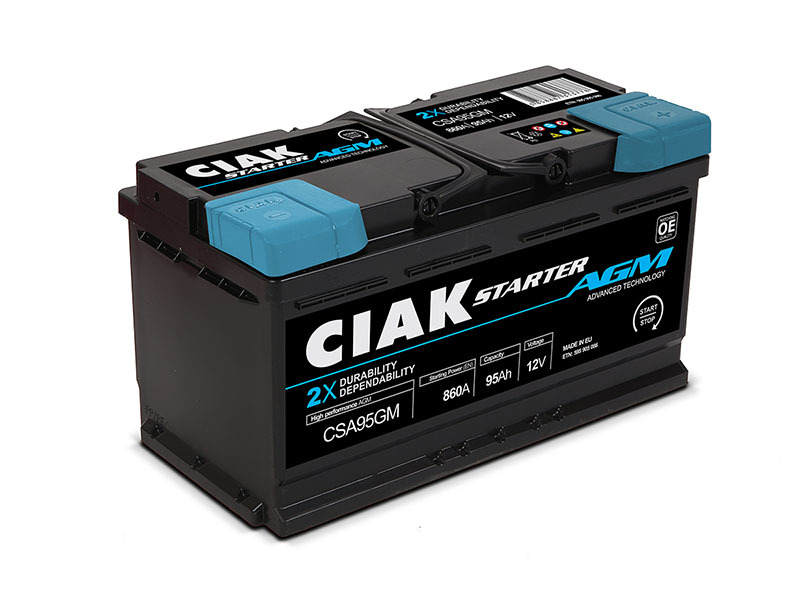 For years, CIAK batteries have been renowned for their top value-for-money ratio, and this is also one of the traits of the new CIAK Start AGM battery. So far, the easiest way to find the CIAK Starter AGM batteries is the CIAK Auto company itself – our specialized retail and service shops spread out across Croatia. CIAK Auto is renowned for the widest array of car parts in Croatia and is the only company which can deliver all the car parts on the market within a single day, due to our close cooperation with the biggest distributors of car parts in Germany and Europe. Apart from this, you can check the state of your battery in the CIAK Auto service shops every day for free, thus making sure that your car battery will be able to start your engine even in the coldest of mornings. Apart from CIAK Auto, you can also find CIAK Starter batteries in all well-stocked shops for car parts and equipment in Croatia and, since last year, at most INA and Petrol gas stations located across Croatia.